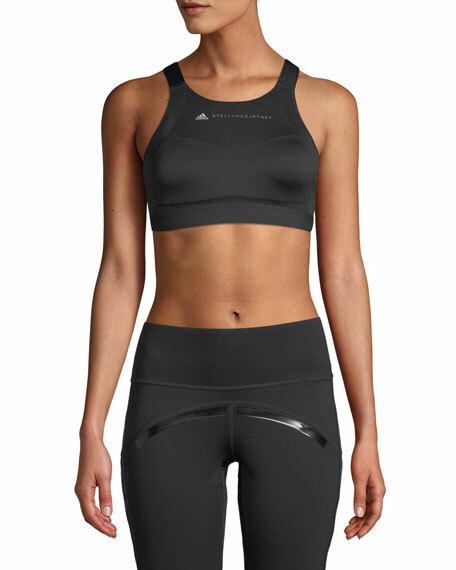 Heroine Sport sports bra with mesh straps. For in-store inquiries, use sku #1720377. Cosabella seam-free, engineered stretch lace. Deep, rounded V neckline; racerback. Soft cups provide light support. Pullover style. Sheer top for demi sweetheart illusion. Nylon/spandex/rayon. Made in Italy. kate spade new york sports bra with leopard-print mesh inserts. Provides support for low-impact activities, such as yoga, walking, and pilates. Moisture wicking, quick drying stretch material. High scoop neckline. Racerback. Pullover style. Polyester/spandex. Imported.